The Uganda Government has entered into a deal with an American-based company, CTI Africa, to start manufacturing smart mobile phones in Uganda. The phone production will be conducted by LifeMobile, which is also a member of CTI Africa on 6th Street in Industrial Area. The announcement was made by Evelyn Anite, the Minister of State for Investment and Privatisation at he National Enterprises Corporation (NEC) offices in Bugolobi, Kampala. “We are very excited that CTI Africa is going to start assembling mobile phones in Uganda. Ugandans are carrying so many mobile phones but none is manufactured here. So, if Ugandans buy these phones, we will diversify our economy because the dollars that would be spent on importing smart phones will be used here,” Ms Anite said. Over $10m( UGsh40b) investment sum is estimated to be spent on capital and 400 jobs created. 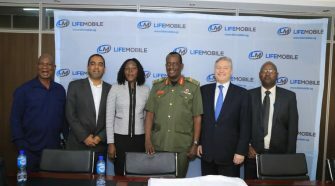 The first production of LifeMobile smart phones will be launched by President Yoweri Museveni early next year as Ms Anite stated. According to the CTI Africa chief executive officer, Mr Michael Landau, the initiative is aimed at developing specialised applications to improve healthcare, mobile banking, insurance, microfinance and education services. Mr Landau confirmed that his team has already partnered with Jubilee Insurance for insurance services, Jumia Uganda for e-commerce, Ecobank and Microfinance Support Centre for e-banking, Medical Concierge and Uganda Protestant Medical Bureau for healthcare services. “Our applications will be very important in improving people’s lives. We want LifeMobile to be a lifeline to all the digital services available. This LifeMobile is about using a smart phone as a tool for life as it will have Apps for healthcare, insurance, e-commerce and banking,” Mr Landau said. “Through the Buy Uganda, Build Uganda policy, we shall put tax barriers for importation of products similar to those produced locally. We have already done that for ceramic tiles and therefore Ugandans need to be patriotic by buying what is manufactured here,” Ms Anite stated.